Vince Poppe giving the opening remarks. Poppe Cattle Company customers looking over the bulls. 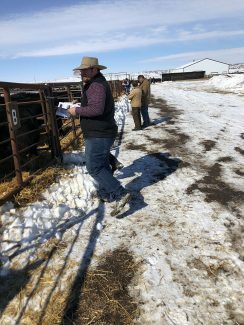 A much needed nice and sunny March 10, 2019 day was in order for the 14th Annual Poppe Cattle Company held at the BD Bar and Restaurant in Fallon, Montana. Once again the Poppe families offered a set of bulls featuring uniformity, power, and disposition to buyers from across the country. 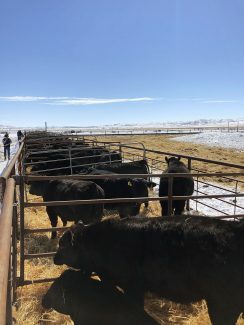 Congratulations to both families on a successful sale! 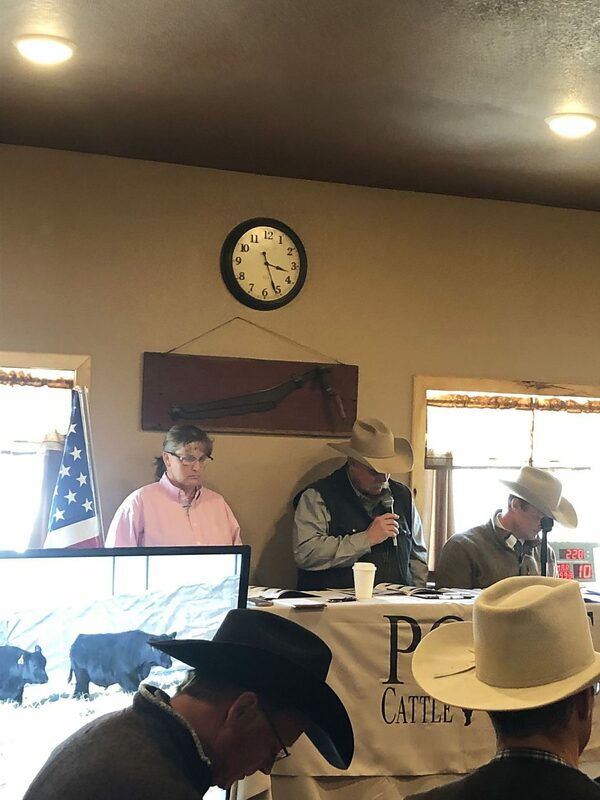 Lot 13 at $14,000, PCC BIG CHIEF 4109F, DOB 3/9/18, BLACK COMPOSITE, KCF BENNETT B29 x PCC Y82, sold to Leland Larson from Greeley, Colorado. 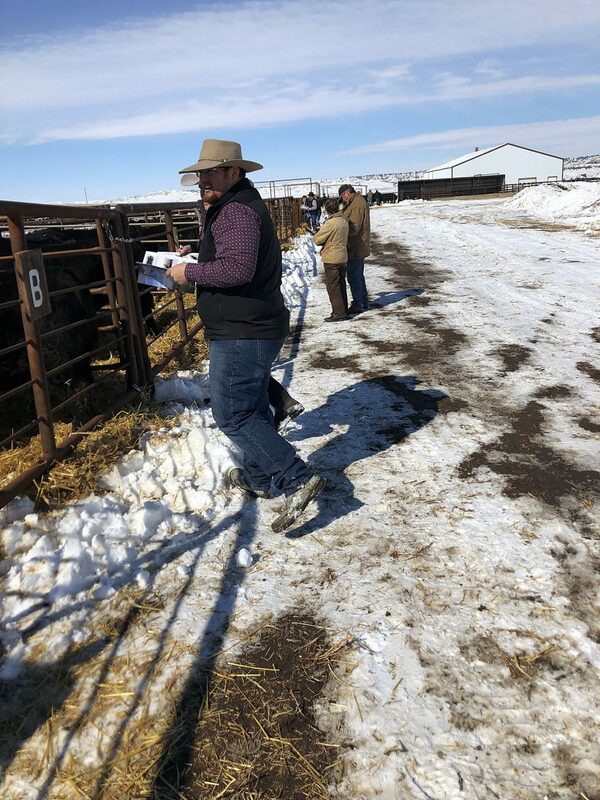 Lot 14 at $13,000, PCC BOXED BEEF 4113F, DOB 3/15/18, BLACK COMPOSITE, KCF BENNETT B29 x PCC X62, sold to Leland Larson from Greeley, Colorado. Lot 16 at $9,500, PCC BOOT CAMP 4108F, DOB 3/2/18, BLACK COMPOSITE, KCF BENNETT B29 x PCC Y70, sold to Del Olkjer from Elbert, Colorado. Lot 9 at $7,000, PCC COURAGE 5151F, DOB 4/1/18, BLACK COMPOSITE, CCR BOULDER 1339A x PCC Y450, sold to Joe Brown from Powderville, Montana. 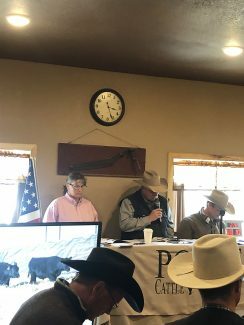 Lot 3 at $6,750, PCC THE DUKE 5161F, DOB 3/17/18, SIMANGUS, CCR BOULDER 1339A x PCC U301, sold to Owl Mountain Ranch from Rand, Oregon. Lot 12 at $6,750, PCC MCCALL 5152F, DOB 3/17/18, SIMANGUS, CCR BOULDER 1339A x PCC Y484, sold to Owl Mountain Ranch from Rand, Oregon.